Some of the most popular ways to address common signs of aging is with non-surgical treatment. Dermal fillers and cosmetic injectables offer a way to soften the appearance of a wide range of concerns with typically quick results and minimal downtime. Dr. Eugenie Brunner, a top facial plastic surgeon, utilizes injectables to achieve a wide range of aesthetic goals. Would you like to learn more? Call us today to schedule your consultation. What Are Dermal Fillers and Cosmetic Injectables? If you want to reduce the appearance of fine lines, look more refreshed and less tired, and/or improve the contours of your face, dermal filler treatment may be right for you. Injectables can minimize signs of smile lines, acne and other facial scars, cheek wrinkles, and dark circles or hollows beneath the eyes. They can also enhance the volume of thin or wrinkled lips, give the cheeks a fuller appearance, and reduce jowling and sagging of the skin. Ultimately, they are designed to produce a lifted, more youthful-looking aesthetic. What Types of Dermal Fillers and Cosmetic Injectables Are Available? Dermal fillers, such as Restylane® JUVÉDERM®, Belotero Balance®, Restylane Defyne®, Restylane Refyne®, and Restylane Lyft® (formerly known as Perlane®) can help restore the youthful contours of the face in all three dimensions. Designed to enhance volume, minimize wrinkles, and augment facial features such as the lips and cheeks, many injectable fillers are comprised of hyaluronic acid (HA)—a naturally-occurring protein found in the skin. The body’s collagen is surrounded by a layer of HA, which is long, flexible, and firm, similar in appearance to a rope. It acts as a cushion for collagen and other structural proteins in the skin. All injectables are administered by our board-certified facial plastic surgeon, Dr. Brunner. Hyaluronic acid is one of the most popular substances for fillers, and it is used around the world. Dr. Brunner often favors HA fillers due to the more natural composition, which is unlikely to cause allergic reactions. Furthermore, the flexible structure makes it possible to mold to the unique contours of the face for more natural-looking results. Although rarely necessary, an injection of an enzyme (hyaluronidase) can break down HA, reversing the effects. Each type of HA-based dermal filler differs in a number of ways. One characteristic is cross-linked strands. When strands of the proteins become attached, or cross-linked, to other strands, the effects are typically longer-lasting. Other differences may include how the fillers are manufactured and the size of the particles in the solution. The FDA has approved Restylane, Restylane Refyne, Restylane Defyne, Restylane Lyft, JUVÉDERM, and Belotero Balance for use in the nasolabial folds (lines between the nose and mouth), and Restylane is also approved for adding volume to the lips. There are several extended applications for dermal fillers, including augmenting the cheeks and lips, reducing undereye bags and troughs, reducing upper lip wrinkles, softening marionette lines (creases from the mouth to the chin), and minimizing other facial lines. Less commonly, injectables may be used to help treat acne scars and add volume to the temples and/or earlobes. JUVÉDERM VOLUMA™ XC is FDA-approved to enhance volume in the cheek and mid-face—currently the only filler on the market with this distinction. Results are often long-lasting, up to two years, and the treatment can bring a noticeable reduction in cheek lines, nasolabial folds, tear troughs, and jowling. Most commonly found in Radiesse®, calcium hydroxylapatite is designed to induce collagen production within the skin, creating a smoother appearance and restoring volume. This type of filler works instantly as well as over time to provide natural-looking results that can last up to a year or longer. More of a remodeler than a filler, injectables that use poly-L-lactic acid are designed to help generate cell turnover and stimulate collagen production for gradual, natural-looking results. Sculptra® Aesthetic is the most well-known injectable made of this substance. With poly-L-lactic acid, several treatments are typically necessary to achieve the desired outcome, which can take two or three months to develop. However, many patients appreciate the comprehensive rejuvenation that can be attained with this type of procedure, and the effects can last two years or more. Many injectables are considered collagen boosters, and PMMA-based injectables like Bellafill® cut straight to the chase. PMMA is comprised of microscopic collagen-stimulating beads and when combined with a bovine protein, can be used to fill folds, deep depressions, acne scars, and wrinkles. One of the top benefits of Bellafill is the long-lasting result. Patients can expect the outcome to last up to five years, and this can be the ideal approach for individuals who find that other injectables don’t last long enough to suit their lifestyle. When implemented by a skilled professional, injectable fillers can reduce common signs of aging and improve your overall appearance. Dr. Brunner has performed thousands of injections, and she combines her extensive experience in cosmetic facial plastic surgery with a background in art to rejuvenate your appearance with beautiful results. BOTOX® Cosmetic, Dysport®, and Xeomin® are neuromodulators. They do not “fill,” as HA-based injectables do. Instead, neuromodulators halt excess muscle movement that is associated with wrinkle development. These types of injectables are often used to address fine lines and creases around the eyes, between the brows, and on the forehead, where our natural expressions tend to form wrinkles. An extensively trained and skilled injector like Dr. Brunner can achieve very natural-looking results that do not impede the ability to smile, frown, or make any expression you like. The treatment involves injection of the filler into the targeted areas with a very fine needle. Most of our patients report minimal discomfort during the procedure. HA-based fillers typically contain a local anesthetic to help numb the area being treated. A slow, careful application and included anesthetic help make the experience more comfortable; however, Dr. Brunner offers cold compresses, topical numbing creams, and additional numbing injections to help make the treatment as painless as possible. She also utilizes blunt-tipped applicators, called cannulas, to minimize discomfort and bruising. Certain areas, such as the lips, are often more sensitive and may require additional anesthetic. Dr. Brunner uses Restylane® & Restylane® Lyft to treat a patient’s lip and jawline. 60 year old woman who notes worsening marionette lines and jowling. Radiesse was used to restore volume loss in the cheeks, soften the marionette lines, and mask jowling. 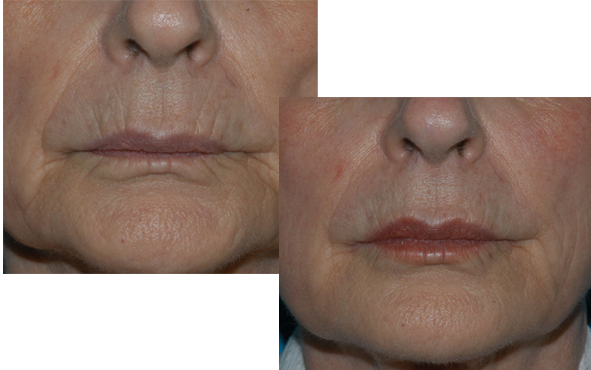 Juvederm was used to soften fine lines around the mouth. Will My Results Appear Natural? Achieving smoother, more refreshed, and more vibrant-looking skin is the goal. After treatment, you should still see yourself, just a more youthful version as the volume loss of key areas is restored. We endeavor to provide profound yet subtle improvement that is both natural-looking and safe. Family and friends may notice a difference, and they may even ask if you have modified your hairstyle or make-up. Typically, they cannot identify the change. During your initial consultation, Dr. Brunner will discuss the available fillers that suit your skin and customize a comprehensive treatment plan tailored to your aesthetic goals. The benefits of most injectable fillers are temporary, and the anticipated longevity depends on the type used and the location of the injections. For example, Restylane and JUVÉDERM typically last 6-12 months, Restylane Lyft, Restylane Refyne, and Restylane Defyne approximately 6-15 months, and BOTOX Cosmetic, and other neuromodulators about 3-6 months. Individual results will vary, and occasional follow-up treatments can help extend the life of the results. Touch-ups once or twice a year are commonly recommended initially, though after several treatments you may discover the fillers have stimulated the production of natural collagen, thus extending the benefits for longer periods. Are There Any Side Effects of Dermal Fillers and Injectables? Some bruising, swelling, and discomfort are normal. Dr. Brunner often advises using cold compresses immediately after treatment to help minimize these effects. She also recommends abstaining from exercise and heavy lifting for approximately 12-24 hours after the procedure. To make your recovery as swift as possible, we offer OcuMend® nanogel technology patches. These innovative pads are infused with Arnica montana and Ledum hydrogen, which have a long history of reducing bruising and swelling after medical treatment. If the patches are placed soon after treatment, bruising and swelling can be greatly reduced and may not occur at all. You should also avoid blood thinners for one week in advance of the procedure. Our office can provide a comprehensive list of medications from which to abstain. Bruising may last up to a week without the use of the OcuMend patches. Let us know if you have a history of facial cold sores, so we may pretreat you with anti-viral medication. What Are Other Ways to Improve Wrinkles? There are numerous facial rejuvenation options available to help combat wrinkles, including Fraxel® laser skin resurfacing, Fractora RF skin tightening, SmartLipo™ for lower face and neck contouring, and surgical procedures such as facelift and eyelid lift (blepharoplasty). In many cases, multiple treatments are required to achieve the desired result. If you have extensive sun damage, Dr. Brunner may recommend Fraxel laser skin resurfacing in advance of filler treatments, which can be used on persistent wrinkles and facial volume loss approximately 6-8 weeks later. If you are interested in injectable filler treatments or wish to schedule a consultation with Dr. Brunner, please contact us today.